Ms. Blanco’s class at Dr. Henry W. Mack/West Little River K-8 Center. Mondays can sometimes be chaotic. After a couple of days off, it can feel like all of Monday is about setting the pace anew. I was mindful of the possibility of Monday messiness when I went to visit Arts for Learning’s After-school Program at Dr. Henry W. Mack West Little River K-8 Center, located at 2450 NW 84th Street, Miami, FL 33147. Given that the program is Monday through Friday, I figured that Monday was as good a day as any, even if it’s a bit messy, to meet the facilitators and watch their interactions with the kids. This after school program, funded by The Children’s Trust, is presented by Arts for Learning in partnership with the Dr. Henry W. Mack West Little River K-8 Center. It is designed as a socially-oriented arts program for children and youth, regardless of prior art or creative expression experience. In fact, no prior experience in the arts is required. Currently, this program services 70 students (although, as of this writing, there may be some new students joining the program), in grades K-8, already enrolled at this school. This fun and educational program teaches children of all abilities arts and creative expression in a social environment, led by A4L’s professional teaching artists, experienced site managers and counselors, as well as a certified literacy instructor. The daily program includes a healthy snack, literacy exercises, as well as fitness and arts activities. Homework support is offered twice a week for participating students. As per The Children’s Trust requirements throughout the school year, after-school program participants must complete pre/mid/post assessments relating to literacy, fitness, and social/emotional growth. Each quarter, the students rotate from artist to artist, providing them with a well-rounded experience from gymnastics to theater improvisation during the school year. As a former classroom teacher, who remembers well the end-of-the-school-day exhaustion, and over-stimulation, I was delighted (and also surprised) by the smiling teachers who were welcoming and helpful in directing me toward the caf-a-gym-a-torium where the A4L After-school Program was about to get underway. As a parent who remembers well the after-school melt-downs, or rushing from school, or instant zone-out, I was surprised by the willingness of kids to engage with staff and with one another, with smiles and support and curiosity. Other than expecting a bit of Monday messiness, I wasn’t quite sure what I was expecting. I quickly realized that I wasn’t expecting the incredible love and warmth, as well as exemplary organization, that was not only rather amazing, but truly uplifting. I was warmly greeted by the site manager, Ms. Sherray Cato. She was no-nonsense, and well organized, and students felt comfortable asking for her assistance. As students were transitioning from the regular school day to the after-school program, they enjoyed socializing and sharing snacks. Several young students came over to me (where I tried to be out of the way) to say hello, hug me, show me a loose tooth, and include me in their afternoon. Their joy and friendliness was contagious. Clearly, the tone of the program facilitates openness, joy, and engagement with others. While the students were in their respective groups with their Literacy Counselors, I had an opportunity to chat with two of the three A4L Teaching Artists, Latrice Bruno and Marisol Blanco. They are both veteran A4L teaching artists, but had the enthusiasm of new recruits. They were grateful for Arts for Learning as a means to broaden the exposure not only to their art forms, but the approach to learning that the arts encourage. Each said that the arts support ALL learning; that the arts can be integrated into various subjects and at every age/grade, from early childhood through university. So what is the approach to learning that the arts encourage? In many ways, the arts, like other approaches, highlight listening skills, attention and focus, discipline, excellence, and of course critical thinking and problem solving, fine and gross motor skills, and social and emotional intelligence. I observed Ms. Blanco’s movement class first. It was notable that her class of about 20 upper elementary-aged kids were all boys. 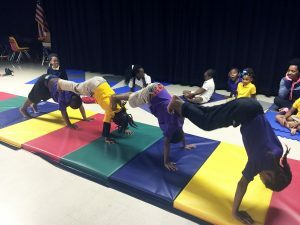 Because of the nature of the dance and movement program that included gymnastics, it was decided that grouping the students at this age in this way was, in fact, beneficial to them. The comfort level was obvious. Ms. Blanco had the students partnered up, and they supported each other through a very rigorous set of stretches. As a dancer, Ms. Blanco taught these students to value rigor and precision while still enjoying the music. The emphasis on flexibility and strength was not merely physical. The arts provide a holistic approach to learning, and even if the kids were just learning how to stretch their bodies and become acquainted with what their bodies could do in unusual positions, the Arts for Learning approach ultimately ensures that kids learn through clear directed practice along with exploration and discovery. I was amazed that each boy was on task at all times. They were perhaps bopping their heads to “Uptown Funk,” while Ms. Blanco adjusted another student’s position; or at times one or another would attempt to see how far he could do the stretch beyond the direction. But this was the joy and freedom that this sort of learning provides. While on task, there is room to explore and to express. With the tumbling aspect of the gymnastics class, the boys had to remember routines (choreography). Students were asked to correct each other, which was not embarrassing or uncomfortable as far as I could observe. Each one had the task of doing the routine, and noticing and correcting one another. They were all eager participants and helpers. Ms. Bruno’s Theater Improvisation class was comprised of the youngest students, in grades K-1. These boys and girls amazed me in their ability to stay engaged and on task at 5:00 pm—after a full day of school, no less! That is a testament to the professional teaching artist, Ms. Bruno, who engaged the students in a myriad of ways, including vocal and audio cues—not merely stating directions. When I observed the class, the students were sitting in a circle on the stage. Ms. Bruno asked, “What is an emotion?” A student answered, “It’s a feeling.” Ms. Bruno enthusiastically acknowledged the student, and did so with each student answering questions, regardless of the accuracy. The arts approach encourages the freedom to guess. Yes, some answers are not accurate (and some are exactly correct). As Ms. Bruno set up the theater exercise, “Opposite Emotions”, kids were excited to have an opportunity to participate. Students were partnered up here as well, and one had to pantomime/express without words an emotion, while the other had to pantomime the opposite emotion, and the other students had to guess the emotions. What a great way to foster social-emotional intelligence as well as expression and critical thinking. As the performance artist that she is, Ms. Bruno directed the students using the lexicon of the theater: “AND…ACTION!” “AND SCENE”. This was hardly a messy Monday. The kids were fully engaged in the activities. There were smiles everywhere and a comfort that I found to be unusual and wonderful. The arts provide a safe space to learn and explore, express and assess. They provide a framework for connecting ideas and experiences. This Arts for Learning After-school program also fosters comradery and cooperation, while each child has opportunities to try on his/her own. The teaching artists encourage individual expression in the service of an art discipline, while supporting one another in the practice. Little by little, the students at Dr. Henry W Mack West Little River K-8 Center are improving their skills, while engaging in a big way with big hearts.